The mobile brand experience extends beyond ensuring your website is mobile-friendly, though that’s always a good starting point. 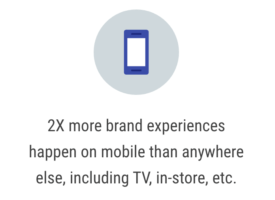 The mobile brand experience can begin one of two ways: One: the user performs a search and comes across your brand in their search results. Provided you have a strong search or SEO strategy, you’re dependent on a potential customer finding you. This is the more passive, sit-and-wait approach. The second way is more proactive: It’s when a user is served a mobile ad and is compelled to visit your site and take action. When and where the ad is seen is completely in the brand’s control, meaning you can ensure the ad is only served to relevant audiences. And relevance, above anything else, is what matters. Relevance is what differentiates your current and potential customers from your non-customers. 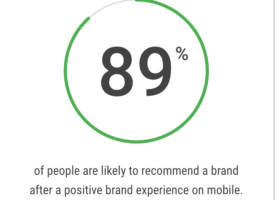 In fact, a recent Google study found that nearly 9 out of 10 times, when people had a relevant mobile brand experience, they said they would purchase from the brand in the future. (Google study, April 2017). 1. Know Your Audience – Some brands invest big money into understanding their target customer. They’ll perform audience segmentation to really understand what drives their purchase decision behavior. They’ll even go as far as creating personas, with names and personalities, so that the marketing team can fully visualize them. Understanding your target audience’s wants, needs, and decision-making process is key to forming a sound advertising and marketing strategy. 2. Find Your Target – Once you know who your target is, it’s time to figure out where they are. If your target customer is a 30-something stay-at-home-mom, then your advertising should appear in different places than if you’re going after mid-career bankers and financial advisors. With digital and mobile advertising, you can not only set your ads to appear on specific apps and websites tailored by interest, but you can also geofence areas based on where your target audience lives and/or works. For example, if you’re trying to capture the attention of those stay-at-home moms I mentioned, then you might consider geofencing suburban areas instead of inner cities or business districts. Being more specific about where you advertise provides cost savings as well as a higher ROI. 3. Drive Action – Of the three, this tip is the hardest to execute because it requires the first two tips to be done – and done well. The goal is to craft a message compelling enough to entice your target audience to take action. But what’s compelling for one person may not be the same for another. For some, getting some sort of cost savings in terms of a coupon or special promotion is exciting. For others, exclusive access to something would be more enticing. Knowing what your audience wants and then converting that into a compelling message is what makes for relevant – and therefore successful – campaigns.